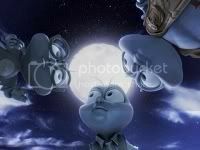 Fly Me to the Moon is an upcoming CGI animated feature film. It should be released on August 22, 2008 in the USA. It is the first animated film to be designed, created, and released exclusively in 3D, I mean in real 3D. Indeed no standard 2D version has been made. 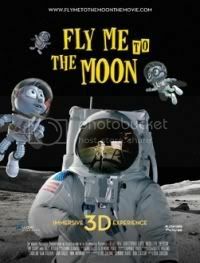 So to enjoy Fly Me to the Moon you'll have to go in your nearest IMAX or an equivalent 3D-capable theater. But well, a movie has to be promoted on more traditional support to reach a wide target, moreover as 3D theaters are still a few. So fortunately, there is a 2D trailer to help us to wait. "Three young houseflies stow away inside the space helmets of astronauts Neil Armstrong, Buzz Aldrin and Michael Collins aboard the Apollo 11 , in the first flight ever to the moon. As they blast off, our three tiny adventurers are about to make some history of their own." A nice animated movie to bring you children to see! By the way, the voice of Buzz Aldrin, the second man to set foot on the Moon, after Mission Commander Neil Armstrong,is done by Buzz Aldrin himself! Indeed Buzz Aldrin is really committed to the promotion of space exploration. I hope this movie will arouse the interest of today's youth in space conquest! This is by far the worst trailer for an animated movie I have ever seen. The fact that this is being released in theaters and not direct to video in the discount bin of a drug store is truly shocking. This movie is unwatchably terrible.